Cheesecake Factory’s Spicy Cashew Chicken is spicy, sweet, crispy & crunchy, this dish is everything you could hope for and more in a copycat Chinese food recipe! 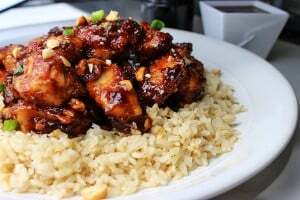 Cheesecake Factory’s Spicy Cashew Chicken is straight from the restaurant’s menu, this is a really spicy Mandarin-Style chicken dish with scallions and roasted cashews. It is crispy while being coated in this amazing sauce thanks to the light texture of the tempura style batter and the rice flour. One of the most popular items on their menu, this recipe is authentically from the Cheesecake Factory, shared with a local news channel. Ok, I know what you are thinking…wow this recipe is full of a ton of ingredients and looks like it takes forever. It is true, there are more steps than normal, definitely more ingredients than I normally use and the set-up does require a number of bowls. Yes, this dish is officially high maintenance. But then you see this… at the end of all that work and you forget about all the steps and all the ingredients and all the dirty dished. OR, you’ve actually been to the Cheesecake Factory and enjoyed this dish, so you know that while it may take a while to make, you would make it even if it took twice as long. It is just. THAT. GOOD. 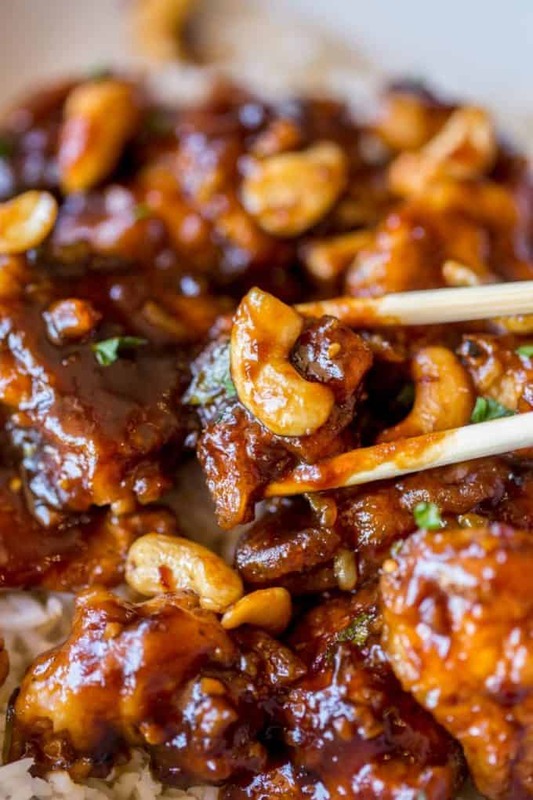 The chicken in this Cheesecake Factory’s Spicy Cashew Chicken recipe has a few steps but it reads harder than it actually is to cook it! 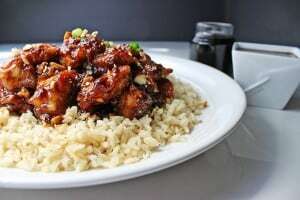 Rice Flour: To make this dish authentically I use rice flour. I have also made it using cornstarch and flour in a 1:1 ratio in the past and the flavor is a bit different but in a pinch go for it! Hoisin Sauce: This is like Asian BBQ Sauce, a ton of flavor and easy to use. Sherry Wine: A sweet wine, if you can’t source this or don’t have time to order online you can swap white wine since the sauce already has sugar in it. Cheesecake Factory’s Spicy Cashew Chicken is spicy, sweet, crispy & crunchy, this dish is everything you could hope for and more in a chicken dish. Plus this recipe is straight from the Cheesecake Factory! Mix the ingredients into a bowl together. Combine all the ingredients together, in a bowl over ice. Keep COLD. Combine the sauce ingredients together and mix well. Toss the chicken with the seasoned flour. 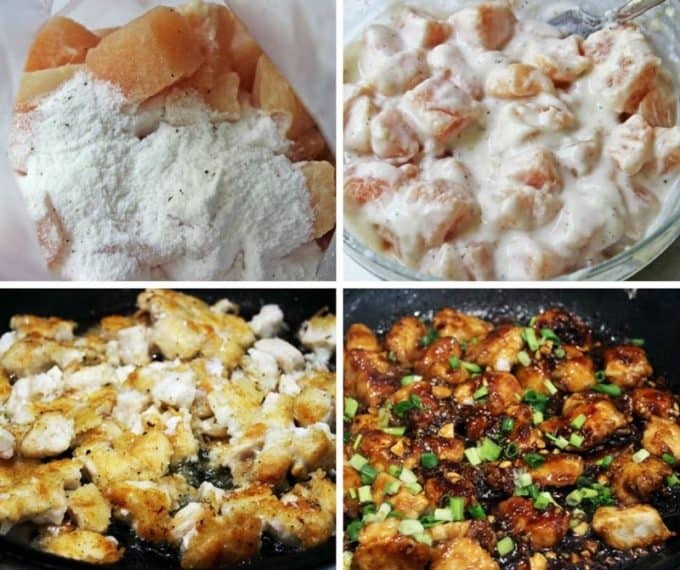 Put the batter into a large bowl with the chicken. Carefully combine the two until well coated. Heat the canola oil in a large pan or wok on medium high. Add the chicken pieces to the pan, and cook 3 minutes on each side until browned and crispy. Break apart any pieces that stay stuck together. 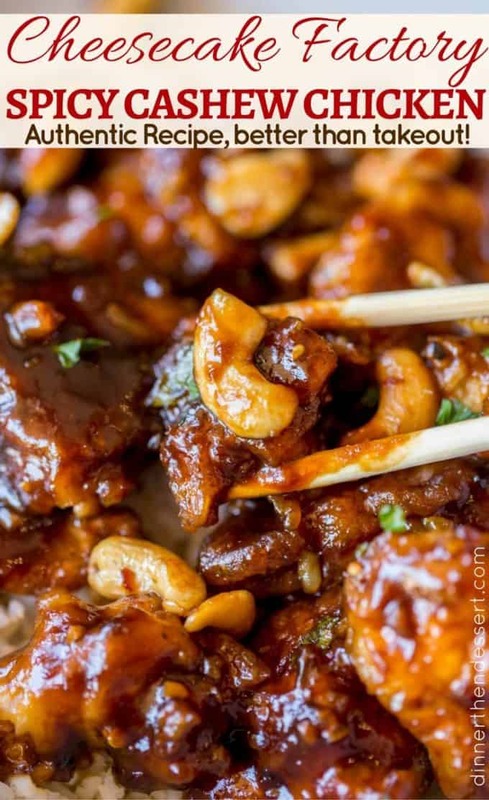 Add the sauce and cashews into the pan. Add in the green onions. Toss all the ingredients together until well coated. Let cook for 30 seconds to a minute for the sauce to thicken. 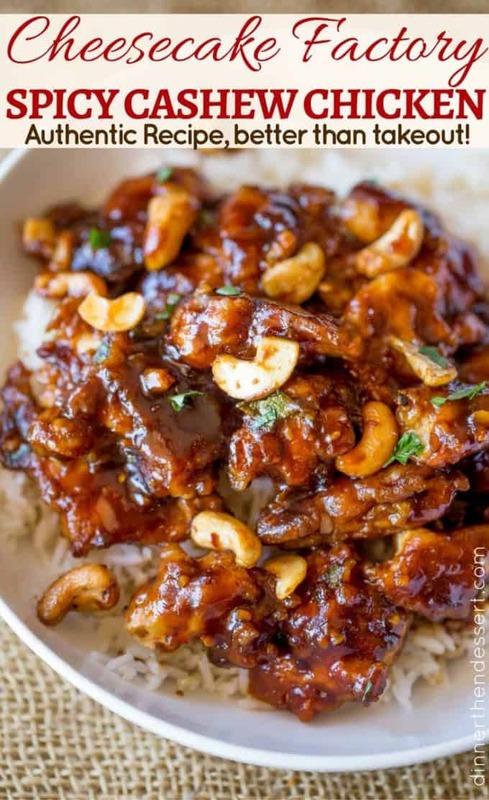 Garnish with sesame seeds, parsley and crushed cashews. Recipe adapted from ABC News courtesy of the Cheesecake Factory. Most of the ingredients in this recipe are easy enough to find. If you have trouble finding rice flour, use cake or pastry flour. In a pinch you can even substitute half all purpose flour and half cornstarch. Wow!! Thank you so much for coming back to let me know! If I don’t want to use any kind of wine, what can I substitute it with? You can substitute the sherry wine for apple cider. I made this last night and it is so DELICIOUS!!!! Yes, it takes a lot of time, however, most Asian recipes that I’ve made have more prep time than actual cooking time. It is absolutely worth the time and effort! One thing that I did was make the sauce first, put in a quart Mason jar, and set aside. That way I just had to shake it again to remix and pour it in. I also didn’t use as many cashews but it didn’t affect the flavor! So good! The recipe is a keeper, I’ll be making it again! 5. Add the chicken pieces to the pan, and cook 3 minutes on each side until browned and crispy. 6. Break apart any pieces that stay stuck together. 7. 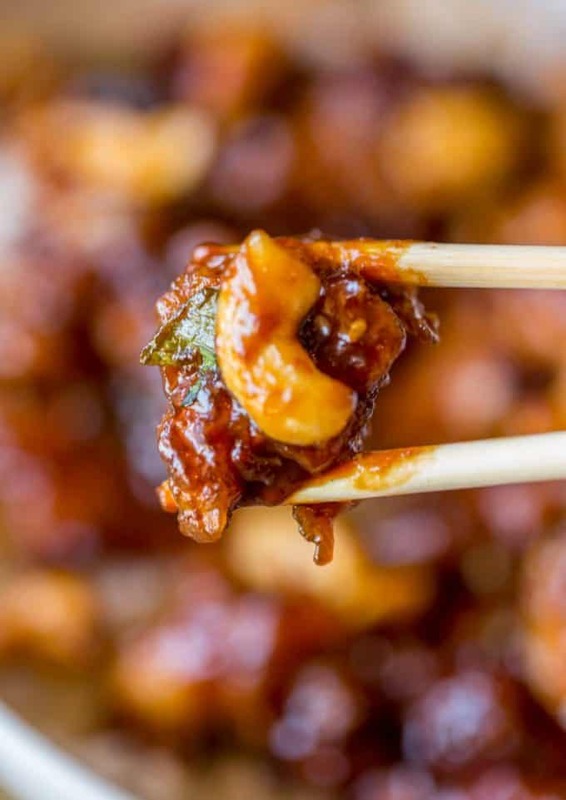 Add the sauce and cashews into the pan. Add in the chicken and green onions. Step 7 says “add in the chicken” which was already done in Step 5. Do you remove the chicken at the end of Step 6 then add back in at the end of Step 7? Also, in Step 5, do you add the chicken all at once or in batches? Sorry for the confusion, I updated the recipe card. Not sure how that got in there. Thanks for catching that. Made for dinner over the weekend and hubby loved it. Normally for a review, I make exactly as instructed as I hate when people change loads and then review their own work instead of the original. However, my one simple change to the recipe I don’t feel would have made a huge impact. I used ice cold carbonated water instead of ice cold water. We have a few Japanese friends who use this when making tempura (another uses vodka from the freezer) and swear by it. So it’s how we make anything as tempura. That one slight change aside, this recipe is superb!! I had to convince Hubby before I started that he would like it, but as soon as the smells started filling the house, he was constantly coming in to say it smelled great and how long before we ate ? not sure who was drooling more from the smell, him or the dog! Dog didn’t get any but hubby proclaimed it the best meal he had ever had and when we’re we having it again? So it was a success! We had left overs and both had them for lunch on Monday, him with rice and mine was eaten cold, in lettuce leaves with a bit of left over quinoa that needed to be used up. Was delicious hot or cold!! It was more involved than most recipes we cook, but as stated, it really is worth the extra washing up. And it’s not difficult to prepare either. Not something to make if you are in a rush in the middle of the week, but certainly worth doing at the weekend when you want a special treat. 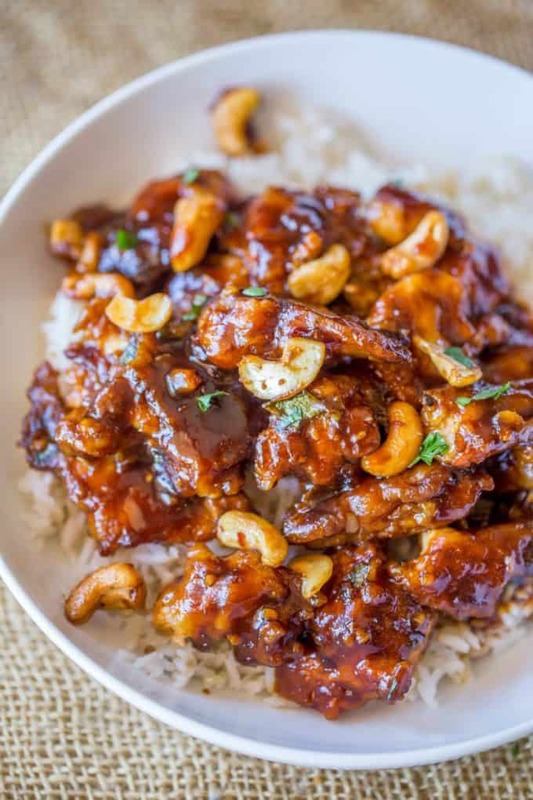 Tried this recipe last night, I cut back the garlic and cashews a bit. It was a little spicy so next time I’ll probably add a little less red pepper flakes. Over all very good recipe, I will definitely make it again. What brand of sherry wine did you use? I used the Holland house Sherry cooking wine, it came out perfect. You can find it in most baking isles. I tried making this tonight. I need help with the batter please. My batter was super thick and sticky, I even put water and ice in the fridge before making it to keep it very cold. Any advice would be greatly appreciated. 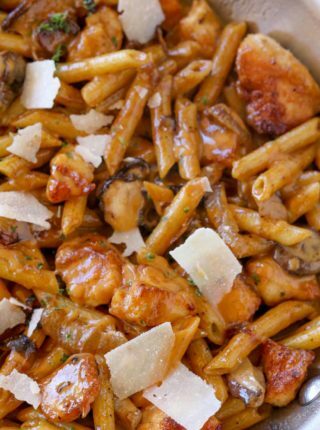 This is my favorite recipe from Cheesecake Factory and I am wanting to nail it at home. This batter is definitely a little bit harder than the usual so don’t feel bad at all with the first attempt. The trick to it is making sure that your egg whites are beaten until they’re really frothy otherwise it’ll be too heavy. Hope you found this helpful! Oh wow, looks like I needed more coffee before responding….there are no egg whites in this recipe. I was thinking of my Kung Pao Chicken Spaghetti. I”m so sorry. The batter for this recipe will be thick and sticky, completely normal. WoW! 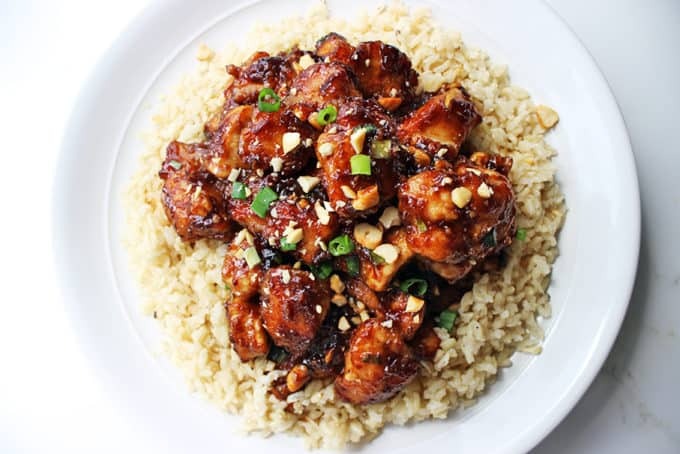 I never tried putting cashew on the chicken, but I think it is so delicious. Cashew has a very distinctive taste so let’s make a try. I’ll pin it on my Pinterest account so I won’t miss the photo. Thanks for sharing. Thanks for the pin, Rhodelyn! I just made this dish came out well. I roasted my cashews in the oven. The other key thing I did was reduce the sauce with the cashews before adding the fried chicken parts, so the chicken stayed very crispy. It was a success big with my family. I used a wok too. What type of cashews did you use? Roasted, unsalted? 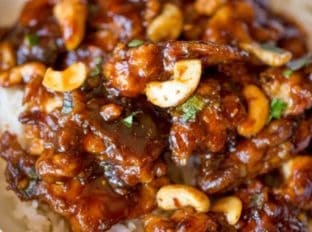 I used roasted salted peanuts for this recipe. I pinned this a couple of weeks ago. Finally made it tonight. Absolutely delicious! I’m hooked. 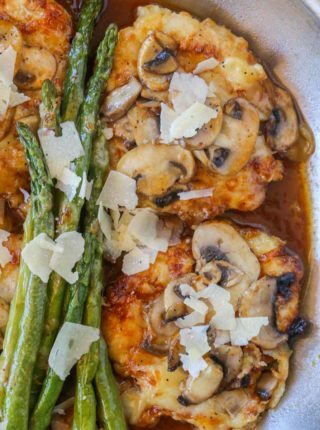 Thank you for sharing this fantastic recipe. So worth the effort, and really not that labor intensive after all. So glad you enjoyed it! Thanks for the pin too!! Made it! Time consuming but spot on!